Kneadatite® Duro, The Original Formulation GREEN Putty. 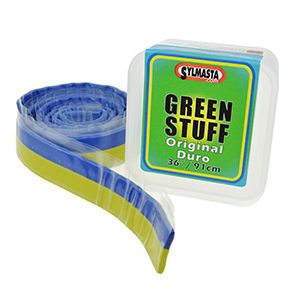 The Original Formulation Green Stuff putty, but in stick form. The stick packaging stops the two putties from touching, preventing any chance of an initial cure. For detail modelling – use it as a permanent filler where slight movement is required. This ‘Yellow and Blue’ putty strip will mix to a green modelling putty which has unique properties that are great for adding fine details. It is malleable when set and can be bent without breaking. 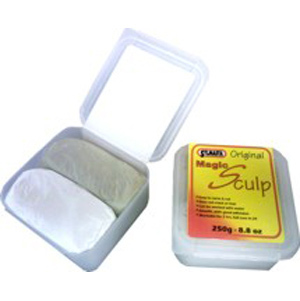 It is ideal for carving giving a very smooth soft cut. DURO Green Stuff can be mixed with Sylmasta A+B to make a slightly stiffer, harder putty.